……..a whole year on, and we celebrate 50 posts, nearly 3000 views and so many inspiring and heart-warming comments. Thankyou to everyone ! 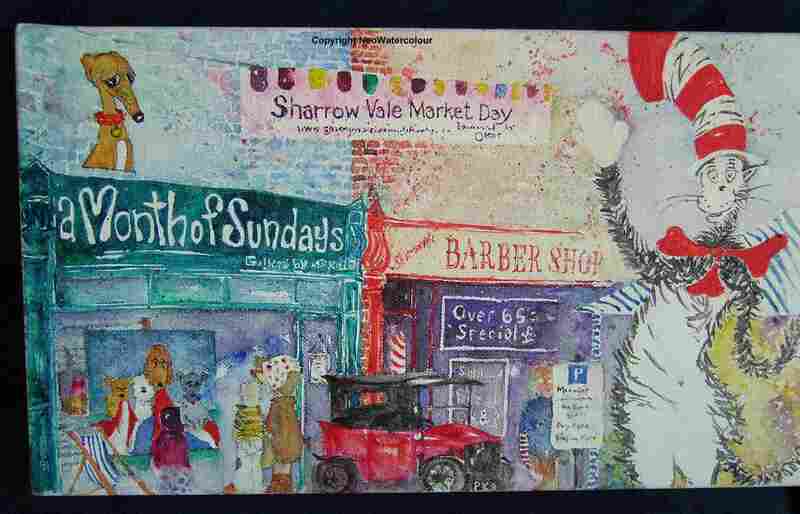 This entry was posted in Sheffield - watercolours and tagged Barber Sheffield, Cat In The Hat, Farmers Market, Month of Sundays, SharrowVale, Sheffield, Vintage Car. Bookmark the permalink. What a great first year anniversary celebration painting with experimental water based oil paints. Tam & I have enjoyed following your creations throughout 2011. Thank you for including us!